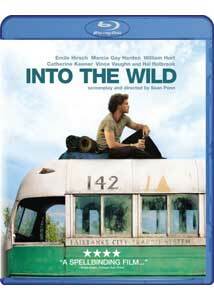 Based on Jon Krakauer's best-selling true story of the same name, this film adaptation comes written and directed by Sean Penn, and tells the life of Chris McCandless�who either led the romantic life of free-spirited wanderer who forsake possessions in favor of nature or was a horribly misguided twenty-something who disowned his family and bit off far more than he could chew. Coming from the outspoken Penn�whose personal/political life often overshadows his natural talents as an actor/filmmaker�I was expecting more of a McCandless-as-modern-day-Thoreau message to come through, but the screenplay does its best to not overly deify its lead character, though clearly the scales are tilted a bit more toward the romantic side. Yet that's part of the real beauty of Penn's take on McCandless and Into The Wild. Because without the sharp analysis of the young traveler�and what others thought of him�that Krakauer brought out in the book, the film is left to mostly let us revel in the magnificent (and ultimately treacherous) outdoors as McCandless moved through it, periodically touching lives like some sort of spiritual Johnny Appleseed. Penn's lead is played by Emile Hirsch, whose striking resemblance to the real-life McCandless is one thing, but who also manages to bound through the vastness of the natural scenery with the same sort of unencumbered spirit that I felt when reading Krakauer's book. You don't have to agree with the way McCandless lived his life to appreciate the innocent idealism that Hirsch brings to the role, as a person who seemed to be very different things to different people. And of those people he encounters (including Catherine Keener, Vince Vaughn and Kristen Stewart), none is more heartbreaking than the character played by Hal Holbrook. He doesn't appear until very late in the film, but Holbrook makes the most of his limited onscreen time with a performance that should indicate that the Oscar for best supporting actor maybe went to the wrong person. Holbrook is not just a simple scene-stealer, but here is capable of delivering what is probably one of the most pivotal moments in the entire story with proper, wet-eyed dignity, and if you are not reduced to tears then you are regrettably hopeless. William Hurt and Marcia Gay Harden are stuck with the thankless roles as the parents of McCandless, left to dangle as the emotionally oppressive forces that eventually pushed away their son. Hurt makes the father robotically distant, while Harden shows a mother possibly trying too hard, and when the darker fragments of their own past and Chris McCandless' childhood get mention, they seem to get neatly painted as the bad guys. What's most frustrating�when looking at the way McCandless lived his life�is how he seemed to simply abandon his younger sister, played by Jena Malone. And no matter how idealistic his lead, it does prove difficult for Penn to gloss over the depth of this familial bond without making Chris McCandless appear maddeningly selfish. Looming as large as any character in the entire film is the voice of Pearl Jam's Eddie Vedder, who provides original songs that do more than just serve as background for the occasional montage moments. The lyrics, while helping spread some of the whole romantic-adventurer angle, often cut with a kind of poetic honesty about what is seemingly important and what isn't. Prior to this I was never much of a Vedder fan, but I was genuinely moved by the way his mournful whine became a forceful and haunting narrative tool. Image Transfer Review: I whooped and hollered about the image quality on the original SD release of Into The Wild, and rightfully so. Yet with this new BD release, we're given a VC-1 encoded 2:35:1 anamorphic widescreen transfer that is even more striking at times; one that reveals exceptional levels of detail in certain scenes, while in other other sequences the improvement is slightly less dramatic. As an example, there is an extreme closeup shot of Emile Hirsch about 08m:29s in, and while the SD release appears to be full of rich facial textures and details, the same BD scene trumps that with razor-sharp clarity. Overall, an impressive transfer that at times bests the SD release by leaps and bounds. Audio Transfer Review: Primary audio options include Dolby 5.1 TrueHD and Dolby Digital 5.1 surround. This isn't the most encompassing surround mix I've ever come across, but the TrueHD option does push Eddie Vedder's musical contributions up a notch in richness. Still, the differences between this and the 5.1 found on the original SD release are negligible. Unlike the BD image transfer�which does offer some easily apparent improvements�the nuances are much less pronounced. Extras Review: You want extras? Then hunt down the French R2 release, because here it's the same old, same old found on the already thin two-disc SD release from March 2008. The minimal extras begin with Into The Wild: The Story, The Characters (21m:53s) and end with Into The Wild: The Experience (17m:19s). Both are SD nonanamorphic letterboxed, and do a tolerable job covering the development of the project, with input from Penn and the cast. On the upside, the film's original trailer is here, presented in HD anamorphic widescreen. The feature is cut into a skimpy 17 chapters, and includes optional subtitles in English, French, Spanish, and Portuguese. Save for an HD trailer, the single disc Blu-Ray release doesn't include any extras not already found on the previous two-disc SD version. There wasn't really all that much there to begin with, so the tipping point is whether or not the image and audio enhancements merit a double-dip or not. The film remains a knockout, a gorgeous travelogue with a tragic coda that we all know is coming. One of my absolute favorites of the year, and highly recommended in whatever format you choose. If you already own the two-disc SD, the need to upgrade is marginal (unless you're a Blu-Ray completist). The good news is that this BD release can be had for less than $20.